Pope Francis leaves a morning session of the Synod of bishops, at the Vatican, Oct. 5, 2015. He urged the contentious gathering of the world's bishops on family issues to put aside personal prejudices and have the courage and humility to be guided by God. Pope Francis on Monday told a contentious gathering of the world's bishops on family issues to put aside their personal prejudices and have the courage and humility to be guided by God. Francis told 270 cardinals, bishops and priests that the three-week synod isn't a parliament where negotiations, plea bargains or compromises take place. Rather, he said, it's a sacred, protected space where God shows the way for the good of the church. The bishops are debating how the church can better care for Catholic families at a time when marriage rates are falling, divorce is common and civil unions are on the rise. The main sticking points include how the church should welcome gays and divorced and civilly remarried Catholics. Conservatives have been insisting that the gathering strongly reassert church doctrine on homosexuality and the indissolubilty of marriage, while progressives are seeking a more merciful approach to a host of family problems. Attendees leave the synod of the family at the end of the morning session led by Pope Francis at the Vatican, Oct. 5, 2015. In his opening remarks Monday, Francis repeated a phrase he used in his homily a day earlier that the church's law cannot become an impediment to its mission of mercy. "God created law and the Sabbath for man, not vice versa," he said. 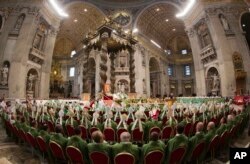 He called for the bishops to show apostolic courage, evangelical humility and faithful prayer over the next three weeks. The courage, he said, was needed since the church's attitudes can, "despite good intentions, distance people from God" and threaten to "make Christian life a museum of memories." He said humility was needed so bishops empty themselves of "their own beliefs and prejudices to listen to their brother bishops and fill themselves with God." "A humility that doesn't point the figure against another to judge them but to extend a hand to help them up without feeling superior to them," he said. Bishops and cardinals pray as Pope Francis celebrates the opening Mass of the Synod of bishops, in St. Peter's Basilica at the Vatican, Oct. 4, 2015. And he called for prayer to hear the "soft voice of God that speaks in silence." The run-up to the synod has been particularly contentious: Conservatives have been mounting a campaign to insist that Catholic doctrine be strongly reasserted. Progressives, meanwhile, have been plotting their own strategy to try to find wiggle room in pastoral practice about giving Communion to civilly remarried Catholics. Catholics who divorce and want to remarry in the church must first obtain an annulment, a ruling from a church tribunal that their first marriage was invalid. Without the annulment, those who remarry in a civil ceremonies are considered to be living in sin and cannot receive Communion, a condition that has led generations of Catholics to feel shunned by their church. Francis has sought a more merciful approach, insisting that these remarried Catholics be fully part of the life of the church. Progressive prelates led by German Cardinal Walter Kasper have called for a process by which a bishop could accompany these remarried Catholics on a path of penance that, over time and on a case-by-case basis, could lead to them receiving the sacraments. In a bid to take some of the divisiveness out of the debate, Francis passed a law over the summer making it easier for Catholics to get an annulment.